—a place where people can create, share, collaborate and keep all of their stuff. Drive is a natural step in the evolution of Google Docs. Drive is built to work seamlessly with other Google applications like Google+, Docs and Gmail, and your app can too. Joining the launch today are 18 web apps that have integrated with Drive using the Google Drive SDK. Mike is a Software Engineer for Google Drive, focusing on all things Drive apps. He gets to leverage his passion for the developer and user experience by working on the next-generation APIs that help unleash Google Drive. Before joining Google in 2010, he was a machine learning researcher, and enjoys engaging in illuminating statistical discussions at every opportunity. 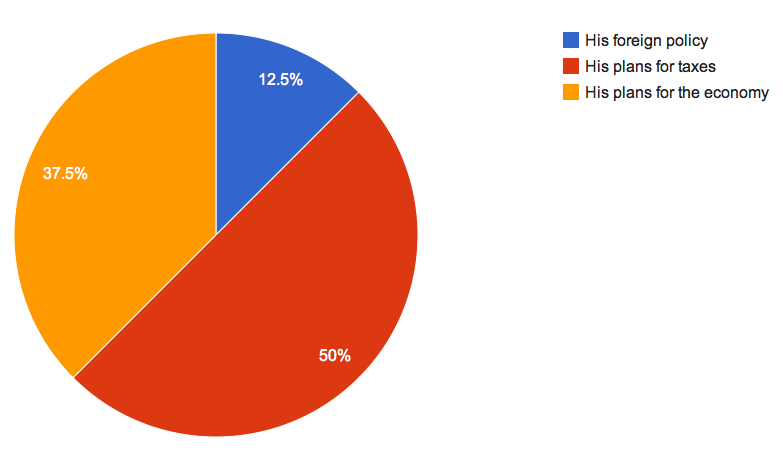 Editor's note: This post is cross-posted from the Google Developers Blog. Recently a company who operates retail stores throughout a few states reached out to Dito. When their associates conduct business discussions with vendors or customers where monetary exchanges are involved, their Ethics Disclosure policy requires a log for each event, a supervisor approval, and committee review. The customer’s existing disclosure review process was cumbersome and time consuming. The employees would add a disclosure review request to a spreadsheet with 29 columns. The new review request would then be reviewed by their supervisor. The supervisor and the employee would go back and forth exchanging emails and making changes to a dense spreadsheet until an approval was granted. It was clear that the customer needed a workflow solution. They decided to hire Dito to build a workflow solution based on Google Apps Script. To make the process more user friendly and productive, Dito decided to build a user interface to collect ethics disclosure events, make updates, and automate the routing of email notifications. Writing a Google Apps Script to create a user interface (UI), enabled associates to interact with their contacts to select their supervisor’s email address and simplify the data collection with list boxes. The script sends approval emails with HTML form radio buttons, text box, approve/decline buttons, and a “Post” command to invoke other workflow scripts. Below are some of the main design points for this Approval Workflow script. 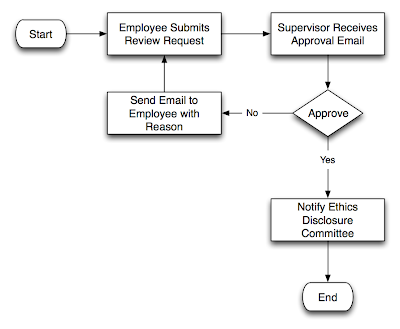 The Disclosure Review workflow requires (a) Associates to fill out the Ethics Disclosure form. (b) Supervisor to either approve or decline the submission. (c) If supervisor approves, the Ethics Disclosure Committee is notified. (d) If supervisor declines, the associate is notified to make corrections. (e) After improving the submission, the workflow repeats itself. 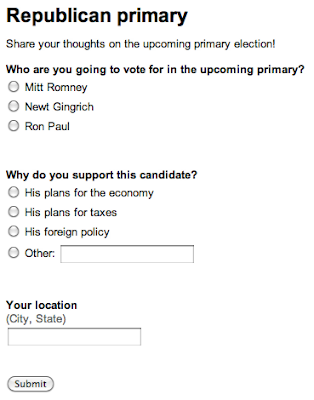 Dito developed a custom review request form. A form was developed using Google Apps Script’s UI Services. The form provides the ability to look up data to populate such things as a drop-down list box. 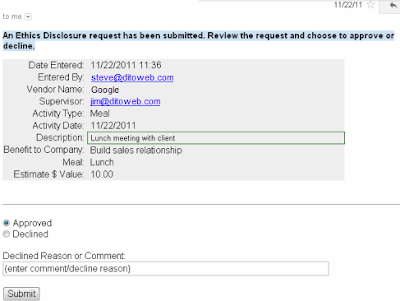 This form allowed real-time email look-ups by using the Apps Script’s Contacts service. First efforts included per character look-ups in a list box, but since they have over 1,000 users, it was best to enter the first and/or last name of their supervisor before initiating the look-up (see code snippet below). Another dynamic field was the “activity type”. Depending on the selection more form fields are displayed. 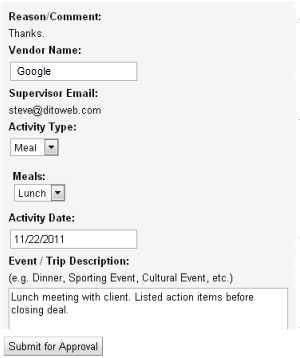 For example, if the activity type is “Meals”, display a list box to select lunch or dinner. When an associate submits his/her review request by using the custom form within a spreadsheet, their supervisor receives an email with easy-to-read HTML formatted results. The approval decision, as well as a comment field (e.g. decline reason), is made within the email. This is more productive and prevents unnecessary back and forth into the spreadsheet. If the request is declined by the supervisor, the associate who submitted the review request receives an email and can review the details. The email also contains a “Continue” button which opens the form in a new browser tab. After corrections are submitted, the supervisor receives another email and the workflow repeats itself. 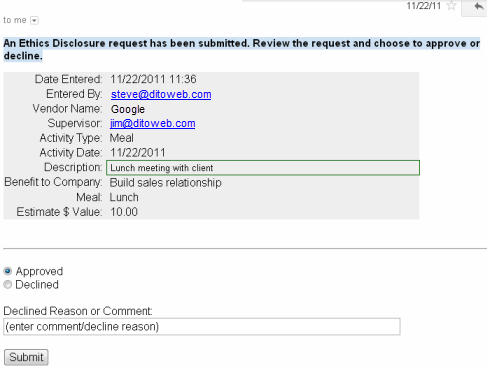 When approved, the Ethics Disclosure Committee is notified by sending a group email within the script. Since history records existed in their original spreadsheet form and they wanted to insert these records into the new work flow spreadsheet as a one-time task, an Apps Script was used to copy the data. 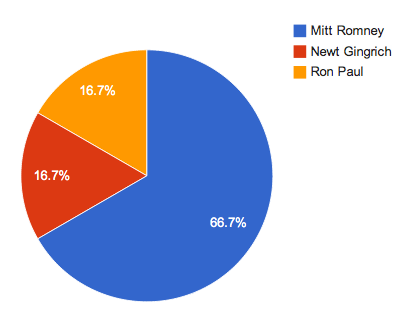 Of course their columns did not match the new spreadsheet. By using a mapping approach and a “read once” and “write once” technique, the Apps Script quickly made the changes. Google Apps Script is very powerful and Dito uses it to build interesting solution for its customers. If you are using Google Apps then be sure to use Google Apps Script. You’ll be amazed with what you can build with it. Google Sites and Scripts expert from Dito specializing in training and application development. When not busy finding solutions to enhance customer capability in Google Apps, Steve shares examples of his work in the Google Apps Developer Blog. lets you perform both of these tasks programmatically. With the Script service at your disposal, you can create smooth install flows, chain your scripts’ executions, generate summaries of current triggers, and even programmatically publish the scripts as services. With the ability to schedule triggers programmatically, it is important to keep track of the existing ones. The function below logs all the triggers that are associated with the current script. Alternatively, you could also write this summary to a spreadsheet or email it to yourself. + "\nTrigger handler function: "
You can now let your users publish your scripts through a Google Spreadsheets custom menu as a part of the script’s set up process. Below is an illustration of this process using an example of a simple note-taking web app. Once a user clicks the menu item, the script becomes published as a service and the URL is presented back to the user via a dialog box. Browser.msgBox("Your web app is now accessible at the following URL:\n"
The Script service provides you with the means of creating even more powerful applications and makes the development and deployment process smooth. For more information, please visit the Script service Reference Documentation and User Guide. Anton is a Developer Support Specialist at Google. He works closely with Apps Script developers to help them discover its full potential. Prior to Google, he worked as a Web Developer. Triggers in Apps Script allow you to schedule your script’s execution in response to an event, at a specific time and date, or at given time intervals. Publishing scripts as services allows you to deploy your web apps with a click of a button. The new Script service lets you perform both of these tasks programmatically. With the Script service at your disposal, you can create smooth install flows, chain your scripts’ executions, generate summaries of current triggers, and even programmatically publish the scripts as services.